Great looking tires are a Pinnacle tradition! Pinnacle Black Onyx Tire Dressing dresses your tires to a rich, deep black finish that is the final compliment to any highly detailed automobile. 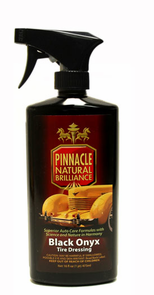 Each application of Pinnacle Black Onyx Tire Dressing coats your tires in a great looking, highly protective coating.� Tires treated to Pinnacle Black Onyx Tire Dressing will retain that rich black finish for several weeks, even when exposed to inclement weather. Pinnacle Black Onyx Tire Dressing is a water-based dressing that leaves tires dry to the touch, eliminating sling-off. This rich spray formula clings to tires, allowing it to penetrate and revitalize the rubber. Other dressings rinse off at the first splash of a puddle or drop of rain. Pinnacle Black Onyx Tire Dressing stays put and helps prevent rubber from drying out or aging prematurely. Pinnacle Black Onyx Tire Dressing creates a dark, rich finish with little sheen. If you desire more shine, apply a second coat or even third coat, allowing 15 minutes between applications. For best results apply Pinnacle Black Onyx Tire Dressing to clean and dry tires. Spray Black Onyx Tire Dressing directly onto the tire or a tire applicator. Spread evenly over tires. This has a really nice look without being to shiny whin sprayed on and gently wiped after a few minutes, and a nice wet shine without being to glossy when dried after spraying on without wiping. It does not have that unrealistic, fake shiny look that some dressings have.